An embryo’s body plan is established by a structure called the organizer. Evidence of this structure in humans has been lacking, but a stem-cell-based protocol has now enabled researchers to demonstrate its existence. Olivier Pourquié is in the Department of Genetics, Harvard Medical School, and in the Department of Pathology, Brigham and Women’s Hospital, Boston, Massachusetts 02115, USA. In 1924, Hilde Mangold and Hans Spemann performed what became one of the most famous experiments in developmental biology. They grafted various parts of a pigmented salamander embryo onto an unpigmented host embryo, and showed that one grafted region induced unpigmented cells from the host to form an extra embryo, resulting in a ‘double embryo’ reminiscent of conjoined twins1 (Fig. 1a). The duo named the grafted region the organizer, because of its extraordinary ability to organize the host cells around it. But in the almost 100 years since this experiment, technical and ethical difficulties have prevented researchers from demonstrating the presence of an organizer in human embryos. In a paper in Nature, Martyn et al.2 use stem cells to circumvent these challenges and provide the first experimental description of the human organizer. Figure 1 | Experimental demonstration of organizer structures. a, In 1924, an experiment1 revealed the properties of an embryonic structure called the organizer. When taken from a pigmented salamander embryo and grafted onto an unpigmented host, the organizer induced the formation of a second embryo derived from unpigmented host cells. b, Martyn et al.2 have demonstrated the existence of human cells endowed with similar properties, using human embryonic stem (ES) cells. The authors treated circular discs of ES cells with the growth-factor proteins Wnt and Activin to produce organizer-like cells (blue). When the discs are grafted onto the extra-embryonic tissue around a chick embryo, they induce the host tissue to form an elongated stretch of neural tissue — the standard test for organizer properties. To fully understand the importance of the organizer, we must go back to the earliest stages of embryonic development. In vertebrates, the fertilized egg rapidly divides to form a ball of poorly organized cells. At a particular developmental time point, some cells on the surface of this ball become internalized, forming tissues called the endoderm and the mesoderm, which respectively give rise to the gut and to muscles and the skeleton. Other cells remain external and give rise to the skin and the nervous system. This fundamental process of internalization is called gastrulation. The organizer lies immediately adjacent to the site at which cells become internalized during gastrulation. It gives rise to specific tissues lying along the midline of the embryo, including the notochord — a structure that controls aspects of development of the central nervous system and eventually contributes to the intervertebral discs. An equivalent of the salamander organizer has been found in fish and birds and in mammals such as rodents3. In mammals, the structure that acts as an organizer is called the node because it resembles a knot, and the site of internalization is called the primitive streak. Unlike salamander embryos, mammals develop in the mother’s womb. Accessing and culturing mammalian embryos is therefore difficult. Indeed, it wasn’t until 1994 that grafts of a mouse node into a host embryo provided experimental proof of the existence of a structure that has organizer properties in mammals4. 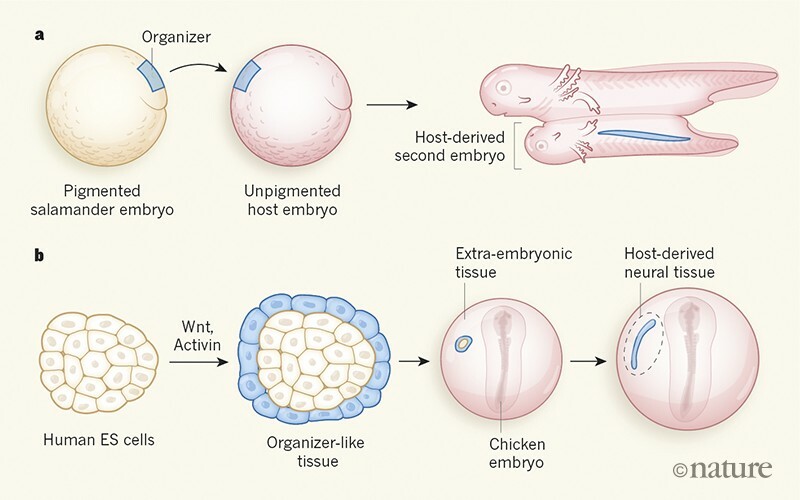 Although no perfect second embryos were formed in these experiments, the grafted nodes did induce the formation of host-derived neural tissues and sometimes other embryonic tissues. Human embryos greatly resemble mouse embryos and contain a structure that looks similar to the mouse node4. Theoretically, showing that this structure does indeed have the role of an organizer would require researchers to access embryos at three weeks of age (when gastrulation occurs), to graft the node onto a host embryo, and to test whether it induces the formation of a host-derived nervous system and skeletal structures. However, obtaining intact human embryos at this stage, for example from a pregnancy termination, is extremely problematic. Thus, whether the node represents a functional organizer in human embryos has remained unproven. One alternative would be to let embryos obtained from in vitro fertilization (IVF) develop in culture until the three-week stage, when the node should be present. However, following an ethical consensus that is enshrined in law in many countries, human embryos cannot be cultured in vitro beyond 14 days, making these studies currently impossible. A second alternative involves the use of pluripotent stem cells, which can give rise to all the body’s cell lineages. Protocols to direct in vitro differentiation of these cells make it possible to recapitulate several aspects of embryonic development in a culture dish. Pluripotent cells derived from human embryos, called embryonic stem (ES) cells, generally form poorly organized colonies when grown in culture. However, the group that performed the current study previously induced5 ES cells to self-organize in a way that resembles early embryonic development. They achieved this by culturing the cells on circular micropatterns (microprinted discs of a material called extracellular matrix that is an optimal substrate for the cells) in the presence of the growth factor protein BMP4. The cultures formed endoderm and mesoderm but did not produce primitive streaks or node-like structures. Martyn et al. took this strategy a step further. 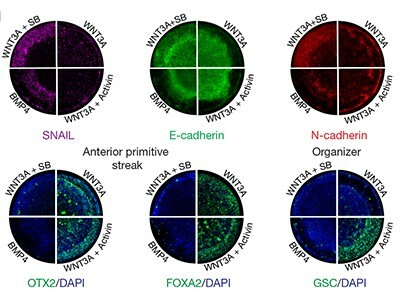 They successfully differentiated human ES cells into a node-like tissue by treating their micropatterned cultures with a combination of the growth factors Wnt and Activin, which are crucial for primitive streak and node formation in mice and other vertebrates6,7. This treatment led to the formation of a structure that showed characteristics of a primitive streak and to the induction of cells that produced organizer-specific proteins, such as Goosecoid8. To test whether this structure also has the functional characteristics of an organizer, the authors grafted its cells onto chicken embryos, in an area destined to give rise to extra-embryonic tissues that support embryonic development. Remarkably, the grafted cells organized into a notochord-like tissue and induced host cells to form elongated neural tissue (Fig. 1b), demonstrating that the grafted structure has the properties of an organizer. One could argue that these experiments still raise ethical concerns because they are performed using human ES cells derived from an early-stage human embryo. However, pluripotent cells generated by reprogramming adult cells, which have essentially identical properties to ES cells, could be used as an alternative, alleviating this concern in future studies. Martyn and colleagues’ experimental system provides an alternative to using embryos to study the human embryonic node. Moreover, their experiments suggest that there is striking evolutionary conservation of organizer function from fish to humans. How the organizer organizes the surrounding embryonic tissues into an embryo remains poorly understood, for now at least. But the ability to produce organizer tissue in unlimited amounts in vitro will allow researchers to dissect organizer function at an unprecedented level. Spemann, H. & Mangold, H. Wilhelm Roux Arch. Entw. Mech. Org. 100, 599–638 (1924). Arias, A. M. & Steventon, B. Development 145, dev159525 (2018). Beddington, R. S. P. Development 120, 613–620 (1994). Warmflash, A., Sorre, B., Etoc, F., Siggia, E. D. & Brivanlou, A. H. Nature Meth. 11, 847–854 (2014). Crease, D. J., Dyson, S. & Gurdon, J. B. Proc. Natl Acad. Sci. USA 95, 4398–4403 (1998). Gritsman, K., Talbot, W. S. & Schier, A. F. Development 127, 921–932 (2000). Cho, K. W. Y., Blumberg, B., Steinbeisser, H. & De Robertis, E. M. Cell 67, 1111–1120 (1991).